To begin, I have to apologize for the long absense of updates here. I had a very busy month that included travel to sunny Miami where I'm currently staying. You can certainly expect regular updates once again. I've tried out a lot of recipes recently, including a few Peruvian and Thai dishes. 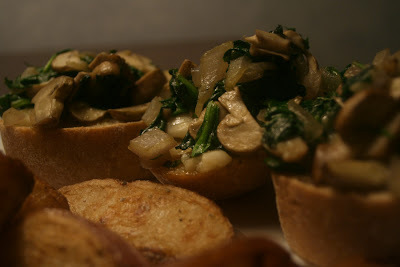 However, my personal favorite for the past little while is a simple mix of mushrooms and spinach that I've been putting on sandwiches and crostini. It's simple but really delicious and makes a great appetizer for the holidays. Served here with herbed home fries for a filling meal that's not too pricey. Over medium heat, add olive oil to your skillet. Once heated, add mushrooms. Sautee 1-2 minutes. Add onion and heat until softened. Add white wine to deglaze. Remove from heat and quickly add spinach and rosemary. Stir until spinach has wilted. Heat on low if necessary, but be careful not to overcook spinach to the point that it lets out too much liquid. Serve on crostini or baguette slices for an appealing appetizer with salt and freshly ground black pepper, or with hummus and marinated tofu for a great sandwich. Serves 1-2 but can easily be modified to make more.